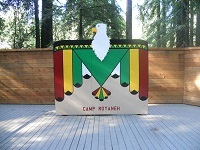 Camp Royaneh is a BSA Nationally-Accredited Scout Camp located in a beautiful coastal Redwoods valley near Guerneville and the Russian River resort area of Sonoma County. 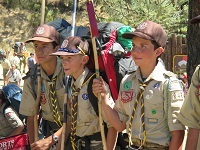 Held during the first week of Summer at Camp Royaneh, Eagle Requirement Camp is a special provisional Scout Summer Camp experience focusing on the merit badges required for Eagle Scout rank. Even though the focus of the camp is advancement, there will be ample opportunities for other activities and a few other merit badge choices as well. Register for this special camp event at the link above, and prepare to have fun in the sun! Wente Scout Reservation is a BSA Nationally-Accredited Scout camp with its own scenic lake located in the rolling hills above the city of Willits in Mendocino County. Provisional Camping is for Boy Scouts who are unable to attend the regular Summer Camp week with their own Troop, or those who wish to attend a different or extra week of Summer Camp. Provisional Camping is available each week at Camp Royaneh and Wente Scout Reservation. Scouts will select the Camp and Week(s) to attend and send in an application with their full Camp fee. All boys must be registered in the Boy Scouts of America and bring a properly-completed BSA Annual Health & Medical form (Parts ABC). Once arriving at Camp Sunday afternoon, the Scouts will be checked-in from 1-3pm and paired with their host Troop and campsite. Those wishing to be paired with another Troop from their own area before the camp week may contact the Council Camping Dept. after submitting their Provisional Camper application to enquire about Troops from their area attending camp the same week. Contact the Camping Dept Admin @ (510) 577-9218 for more information. Take your leadership skills to the next level! National Youth Leadership Training (NYLT) is a high-energy week of fun activities including advanced leadership training, outdoor skills, and team-building. NYLT is open to all Scouts BSA youth who are at least First Class rank, 13 years of age and completed 8th grade, as well as Venturing Scouts. These courses are very popular, so sign-up early at the link below! There are numerous opportunities for Boy Scouts to participate in Shooting Sports throughout the year. From the relaxed atmosphere of shooting sports days where Scouts can practice at their leisure, to Shooting Sports Merit Badge days, where Scouts pick one discipline to work on, to Shooting Sports Weekend where Scouts rotate through every Shooting Discipline during a weekend campout. Click to find out more information on Shooting Sports activities. 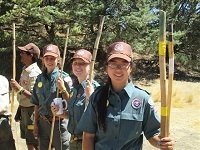 Held during the Spring, Fall and Winter School Breaks at the Youth Leadership Training Center in San Leandro. Full-day hobby, personal interest and life-skill sessions for boys & girls ages 11-17. Sessions utilize the various Boy Scout Merit Badge program topics, and currently-registered Boy Scouts may complete requirements toward the corresponding Merit Badge. Please see the current availability of sessions scheduled on our website calendar during those School Break periods. The Achewon Nimat Lodge of the Order of the Arrow invites all Troops, Crews, and Ships to this exciting Winter outing in the snowcapped Sierra Mountains. For more information, please see the link below. Fun and games in the snow await you!